Legislators in California are working toward lowering the amount of alcohol you can legally have and legally drive. Researchers share how much of an impact this type of legislation could make. SACRAMENTO, Calif — Over 10,000 people die annually from drunken driving accidents nationally. California has over 1,000 deaths annually from drunken driving accidents. 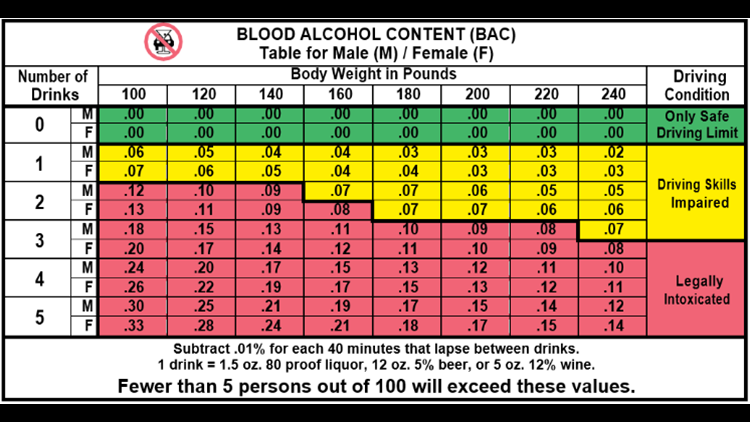 Assemblymember Autumn Burke (D-Marina Del Rey) introduced a bill Feb. 22 that would cut the maximum allowed Blood Alcohol Concentration (BAC), the amount of alcohol in a person's blood, for driving, from 0.08 percent to 0.05 percent. Assembly Bill 1713 would help reduce the 1,000 DUI deaths in California each year, state lawmakers say. But will lowering the legal amount of alcohol in a person's blood by 0.03 percent really make a difference in reducing drunken driving numbers? Researchers think so. The National Academies of Sciences, Engineering and Medicine released a report that calls for Lowering the BAC level and other initiatives to work toward decreasing the number of fatalities related to drunken driving. The study titled, "Getting To Zero Alcohol-Impaired Driving Fatalities," calls for all states to lower their BAC limit to 0.05 percent. One of the researchers who compiled this report, David Jernigan, said he found that around 1,500 lives annually could be saved should the legal BAC limit be reduced. "For planes, there is a zero tolerance for death, but for cars, we are willing to live with 10,000 deaths," Jernigan said. "It's not just the risk you pose for yourself; its the risk you pose for other people when you drink and drive." Jernigan said that they found that impairment of people when drinking alcohol begins when they reach 0.04 percent BAC and that 0.05 percent BAC level is more accurate of a level for when people really begin to pose a risk when driving. Jernigan said that reducing the BAC limit is not the only thing that can be done to reduce fatalities related to drunken driving. "This is a step forward we can take to save lives," Jernigan said. "We can do better." Jernigan said that they know the list is long but just starting with reducing BAC limits can help a lot. In lowering the BAC limit, people would only be able to drink around 1 to 2 drinks before being considered impaired. Currently, some people may be able to get away with drinking between three and four before hitting the 0.08 percent BAC level. Some may argue that why don't they increase the punishment given to those that drive drunk. Jernigan said that increasing the punishment typically does not help. He said the best way to deter people from driving under the influence is to keep the punishment swift, certain and severe. CHP is partnering with Nevada Highway Patrol to participate in an "I-80 Challenge" to reduce distracted and reckless driving. It will go on for a week, to work alongside CHP's annual Labor Day Maximum Enforcement Period.